17th century onwards. A very basic sink in which to wash food, etc. There were no taps; the water was poured into the sink from a bucket. To empty the sink, the slate plug was removed and the water emptied into the bucket underneath. Mid 19th century onwards. A large copper or, later, a cast iron cauldron built into the corner of the scullery or wash-house. It was enclosed in a brick surround with space at the bottom for a fire to heat the water. The fire lights up. Available in either brick or whitewash finish. Mid 19th century onwards. The mangle was used to wring the water from wet washing and also to press and smooth almost dry washing. The screw at the top was used to adjust the pressure on the rollers below. 19th century onwards. Flat irons were usually used in pairs, one heating while the other was used. They were heated in front of the fire propped up on the trivet or on top of the hob on an enclosed range. Table with wooden washing tray, washboard and duckboard. The wooden washing tray was placed on top of a table to prevent too much stooping. It was used in conjunction with the washboard for hand rubbing of stubborn stains before the washing was boiled. The floor got very wet and so the duck-board was used to stand on. 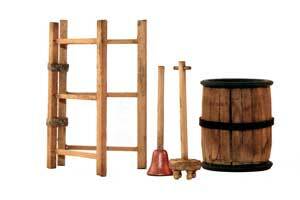 Wooden dolly tub, dolly peg, posser and clothes horse. Before the washing was put into the copper to boil the dirt was pounded out using the dolly peg or posser in the dolly tub. The clothes horse was a folding wooden frame to hang the clothes on to dry. It folds flat for storing away. A besom was an early form of broom made from twigs tied to a wooden handle. A malkin was a mop made from string tied to a long handle. The first portable folding ironing board was patented in Canada in 1875.